To report any acts of animal cruelty or an animal that is injured/in distress please call the 24/7 National RSPCA Cruelty line on 0300 1234 999 . They will be able to dispatch an RSPCA inspector, if necessary, to investigate any cruelty or suffering. Anyone who wishes to report a missing pet or tell us about an uninjured stray they have found will be asked to go to www.petslocated.com to register the animal’s details. Once you have registered an uninjured stray dog on petslocated.com, you must then contact your Local Authority who are legally responsible for stray dogs. Got a question about animal care or the RSPCA ? 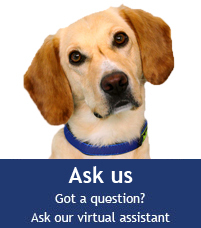 Click on the doggy below to ask our virtual assistant ! !